Canadian Silver Coins are an outstanding acquisition on the precious metal market, being recognized all over the world for their value, aesthetics and artistic designs minted by the RCM Mint. 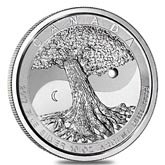 The Royal Canadian Mint has produced its noteworthy coins since 1908, and starting with the year 1988, the Mint began manufacturing silver bullion coins. 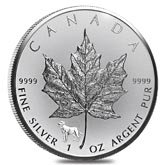 Canadian silver is recognized globally because of its impressive .9999 silver purity and the scarcity of their gorgeous coins desired both by collectors and investors. The mint achieved many awards, such as being the first mint to produce colored, hologram, square coins, thus making the RCM silver an artistic piece of worldwide coinage. 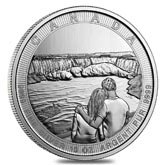 Each year, the RCM mints special edition coins and series, celebrating Canadian landmarks, wildlife, and historical figures. 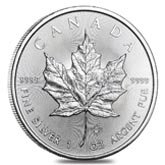 The most famous silver Canadian coin minted by RCM Mint is the Canadian Silver Maple Leaf, first manufactured in 1988 and stamped every year since then. The obverse of the Silver Maple Leaf coin features the image of Her Majesty Queen Elizabeth II in three issued variations: an older, middle-aged and young portrait version. Besides the impressive Queen’s portrait, the obverse side of the coin also features an inscription of the coin’s value and the year of issuance. The reverse side of the Silver Maple Leaf features the image of the Canadian national symbol the sharply detailed Maple Leaf. Another impressive silver Canadian design is the Wildlife Series, with a strict issuance of just one million pieces for each of the six designs in the series. 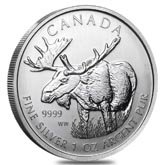 Royal Canadian Mint Silver coins of this series were issued in sets of two between 2011 and 2013: The timber Wolf and Grizzly in 2011, The Cougar and Moose in 2012 and the Pronghorn Antelope and Wood Bison in 2013. The first four designs were created by William Woodruff, Senior Mint Engraver, but the last two are courtesy of Emily Damstra. This unique series also inspired her to design the Canadian Birds of Prey Series consisting of 4 coins: the peregrine falcon, the bald eagle, the red-tailed hawk and the horned owl. 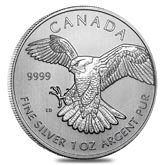 Silver Canadian Coins are available in many sizes and variations, presenting an excellent opportunity for diversifying your investment or collectibles portfolios with the finest .9999 pure silver coins. The Royal Canadian Mint produces coins in 1/2 oz, 1 oz, 2 oz, 5 oz, 10 oz, and half kilo weights. Besides numismatic coins, RCM also produces Olympic medals and military decorations using their holograms, laser, and embedded crystals technologies. These exquisite government-issued coins are also IRA-eligible and can be used as a solution for hedging against inflation. Their unique striking designs make them an excellent and affordable option for special occasion gifts, that could preserve their purchasing power during years. 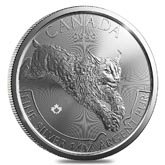 Bullion Exchanges is pleased to offer a wide selection of silver coins manufactured by the world renowned Royal Canadian Mint. If you have any questions please don’t hesitate to contact us by phone at 800.852.6884, send us a message or connect with us via our live web chat.